Give Your Hudson Hardwood Floors a New Look! Finding the absolute best option for hardwood floor refinishing Hudson OH has available can be extremely difficult. There are so many choices between professional refinishers, all the way to DIY projects. Luckily, Fabulous Floors has years of experience and a proven method! On top of that, our technicians are passionate about helping you get the dream home you’ve always wanted. When people ask what the most important thing is, price or quality may come to mind. While those are important, our priority is customer service. Our goal is to provide a service that stands out from the rest. Because of that, we have only the best individuals in your home with all the proper knowledge necessary to answer questions and get you the right service specific to your individual home. You can trust us when it comes to wood floor refinishing in Hudson. 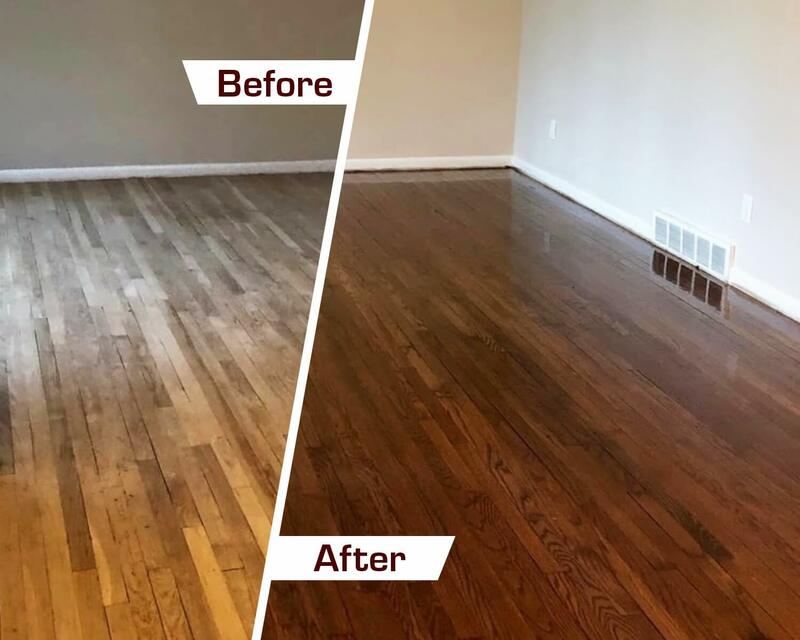 Fabulous Floors has worked for years and years to develop a wood floor refinishing service in Hudson that is effortless and easy for our customers. At this point, it’s as simple as four steps. First, our experts evaluate your home wood flooring, explaining in detail our process, answering any specific questions you might have (again, each job is different, and we want you to have the individual care you deserve). Second, we use our state-of-the-art sanding equipment to remove the typical scratches, bumps, and dents that come from day-to-day life. Third, and this is the fun part, we then stain your wood floor with your chosen color. This lets you get creative and involved! Finally, once the stain dries, we apply our polyurethane finish to “seal the deal”, protecting your floor from damage in the future while also making your floor shine. 2. Professional sanding equipment is used to remove any scratches, dents or dings. 4. Once dry, we apply a long-lasting polyurethane finish to protect from future damage and extend the shine. This process usually takes just a couple days (rather than some DIY projects taking weeks or even months!). On top of that, we are Greenguard Certified. This means that our entire service (from start to finish) will be safe for you, your loved ones, AND the environment, all while helping you achieve the look you’ve always wanted! Rather than waiting until tomorrow, take advantage of our hardwood floor refinishing service in Hudson today! Give us a call at (440) 256-9400 for a hassle-free estimate. Check out this video to learn how Fabulous Floors Cleveland uses their refinishing system to bring back the beauty of your hardwood floors, without the cost of getting all new floors! Serving Cleveland, Mentor, Lorain, Parma and the surrounding areas with affordable hardwood floor restoration services.